Figuring out what sewing machine to buy can be tough. 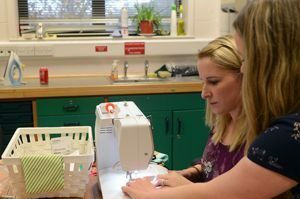 Every quilter has some needs that are the same and some needs that are unique to them. This list is here to help quilters find the machine that best balances those needs into one marvelous sewing machine. This is why I use a large throat sewing machine for quilting. Throat and arm length are very important when choosing the best sewing machine for quilting. That and available stitches are the most important features for me. 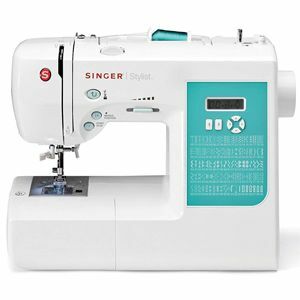 Singer is a classic name in sewing machines which is why I had to start this article off with the Singer Quantum Stylist 9960. Singer is a great merger between affordability, usability, and quality. Singer’s Quantum Stylist is an excellent machine for at home quilters who are just starting out. The top three beginner friendly quilting features are that the tension is automatically controlled, there is a speed lever that lets the user set the maximum speed, and the digital information adviser. Tension being auto controlled is a huge plus for beginning quilters who can be overwhelmed by figuring out what tension is best for what thread and fabric. The speed control setting helps ensure the user doesn’t accidentally slip and go to fast, which could cause disaster, or even break the needle. The digital information adviser is fantastic. That is where you set your stitch along with its length and width. After you have set your stitch the adviser will tell you what presser foot you need to use. 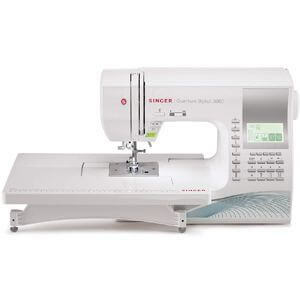 The Singer Quantum 9960 is an ideal machine for a novice quilter. Many of its features remove the hassle and learning curve from quilting. 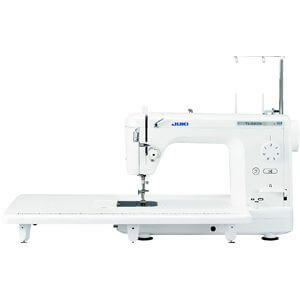 It is also a quality general sewing machine that has the strength and versatility to handle many tasks. When it comes to a no frills yet intuitive and good sewing machine for quilting for a beginner look no further than the Brother XR3774. Don’t be fooled by its bare basics design, this machine can do everything a beginning quilter needs. It’s the least expensive Brother machine that still has the wide table needed for quilts. Everything about this machine is easy to use.The automatic needle threader is a massive win with me. The machine threads the needle for you, all you must do is push the lever on the side of the machine. The easy stitch selector makes picking your stitch easy for everyone. It may not have the hundreds of stitches offered by other machines on this list, but you also won’t be flipping through menu after menu looking for the perfect one. Just turn the dial and you are good to go. Need to take your sewing up to the next level? 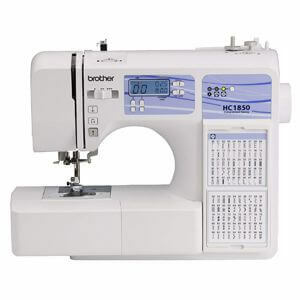 Brother makes some seriously good sewing machines and the Brother PQ1500SL is no exception. 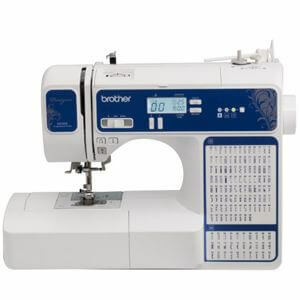 This Brother machine is one of the top rated sewing machines for quilting on Amazon. It is one of the best quilting machines you can buy for under $1000. This sewing machine was made with quilting in mind, it has a 8” throat and a 12” X 18” extension table. Not only that, this machine moves incredibly fast, 1500 stitches per minute! It uses a foot pedal to control the speed you can go full speed or turtle slow with this versatile machine. This sewing machine also has a quiet motor, letting you sew without worrying about waking the kids. PQ1500SL has 4 feed dog heights and it is a breeze to adjust them, with a small color-coded lever on the front of the machine. 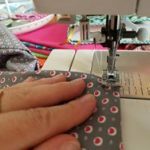 It has an auto thread trimmer, built in needle threader and an extra-large bobbin all of which allow you to keep focused on quilting and not messing with the settings on your machine. If you are looking for a high quality yet affordable sewing machine for quilting look no further. This top of the line Brother won’t let you down. 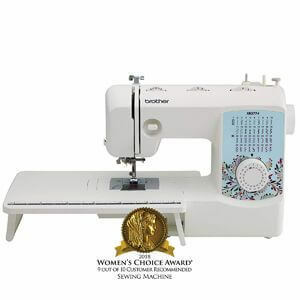 The Singer7258 is an award-winning machine that would make a great addition to any quilters craft room. It is perfect for quilters who want a mid-range machine that won’t break the bank or take up too much precious craft room space. This computerized sewing machine has 100 different stitches with a full control of stitch length and width, a quilter’s dream! It weighs less than 15 pounds and is 14.5” long, making it easy to store when you aren’t using it. It doesn’t have an extension table to facilitate quilting but if space is at a premium that can be a huge plus. Its presser foot has an extra high position to accommodate even the thickest of quilts. The automatic stitch speed slider allows automatic sewing without using the pedal, easily adjust the automatic speed mid stitch by moving he slider left or right. At under $200 this Singer sewing machine is perfect for entry level quilters on a budget. It is an award winning, highly rated machine that will be a great addition to any quilter’s craft room. Juki makes serious machines for serious quilters. This Juki is no exception! Made from die cast aluminum for industrial quality in a home machine, you can’t miss with this Juki. Not only is this Juki made from aluminum it also is mainly manually controlled, with few computer controls to potentially break. This quilting machine is great but it is not for the novice quilter. This machine is a workhorse designed with the straight stitch and free motion quilting in mind. It has the power to quilt through all the layers just as easily as if there was only one. The automatic thread cutter control is located on the foot pedal, something that takes a bit of time to get used to but is very handy when you do. If you want a machine that can quilt really well, without any bells and whistles this is a great machine. This Juki is built to do two things, quilt and last a lifetime. This quality machine is definitely worth its price tag. Juki TL-2010Q has a lot in common with the TL-2000Qi, both are bade from cast aluminum, can sew 1500 stitches per minute and have stitches up to 6mm in length. However, the 2010Q has a few features that really make it worth the extra money. The number one feature in my mind is the max speed control lever. It allows the user to set the maximum speed aiding in precision when sewing those intricate quilting designs. The TL-2010Q also comes with a ¼” and a 1/5” hopping foot, which holds the fabric down as the needle comes out of the fabric and lifts as the needle goes down. This foot holds the fabric more firmly giving a good consistent stitch that aides in beautiful free-motion quilting. TL-2010Q’s thread sub-tension lever is really the last thing to set this Juki apart from the other. The sub-tension lever allows you to adjust the thread tension manually and then holds it in place, ensuring the thread tension does not become too tight or too loose. 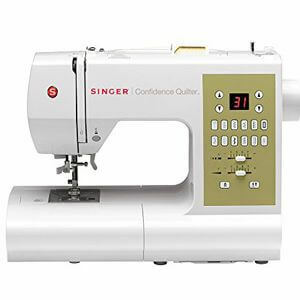 The Singer 7469Q is a great machine for people who know they want to sew and who want the option of quilting but aren’t in the market for a single use machine. This sewing machine is easy to use and to set up and is great for novice quilters. The Singer 7469Q is called the Confidence Quilter for a reason. This sewing machine is wonderful for the budding quilter who wants to dip their toes but isn’t quite sure if this is the hobby for them. The 12 most used stitches are available at the touch of a button while all 98 of the stiches are visible in a pull-out sheet at the bottom of the machine. Like the other Singer machines, you have full control over the stitch width and length which is extra important when learning how to quilt. This sewing machine has all the features that make Singer sewing machines great to use. It has been specifically designed with the novice quilter in mind and makes a great buy for anyone who is new to the art. Brother is a great brand that has a machine for every level of skill. Brother HC1850 is perfect for the beginning sewer who wants the added benefit of computerized functionality. This versatile sewing machine comes with everything you need to explore the world of quilting. Coming in at just under $200 it is an incredibly affordable sewing machine for a beginner. It isn’t just for beginners however as it includes 94 decorative stitches and 12 heirloom stitches. That is more than enough variety to keep any quilter happy for ages making beautiful quilts. This wonderful machine comes with everything you need to get started quilting. It also has enough versatility that you won’t outgrow it soon. Combine that with the fact that its affordably priced and this machine is can’t miss. 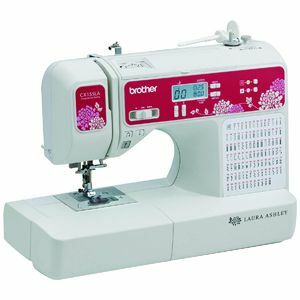 Brother’s Laura Ashley CX155LA is a limited edition sewing and quilting machine. It was designed with quilting and home decorating in mind. This machine can handle any project you throw at it. It truly is one of a kind. This limited edition sewing machine has so much bang for its buck, its clear to see why it is limited edition. It comes with 11 accessory feet and has every stitch option easily referenced on the front and top of the machine. The ¼” quilting foot is perfect for piecing together the quilt top. The Quilting guide will help keep the lines of your quilt uniform. 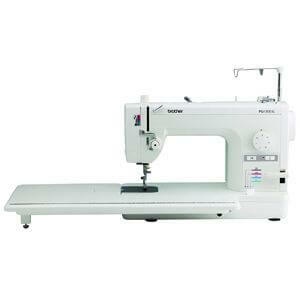 This sewing machine is sturdy and simple, it has a stitch for every situation. It is designed for both quilting and home decorating, so it has no problem working through all the fabric and batting in a quilt. Brother knocked it out of the park again with its DZ2400. The Designo line marries affordability with capability, allowing for feature packed machines like this one to be purchased at an accessible price. DZ2400 has a push lever needle threading system that makes needle threading a breeze. In addition to that when you select the stitch you desire the LCD display will tell you which foot is needed, eliminating the guesswork for beginners. The instructional DVD it comes with explains in detail any feature that the user might feel is complicated. This is much better than relying on YouTube tutorials that might not cover everything. The bobbin winder instructions are clear and easy to follow, an important plus. The Brother DZ2400 is a great buy for anyone who is in between machines and needs something quick that will handle all their needs. It is also great for anyone who is learning how to quilt but is intimidated by all the options available in terms of stitches or presser feet. This sewing machine takes the guesswork away, making it a wonderful learning machine. It really depends on your current level of skill. There is a sewing machine for quilting for every skill level and price point. Look at what you need out of a sewing machine and figure out what is important to you. Look at the sewing machine specs; the amount of space it takes up, how heavy it is, how many stitches it can do, how easy it is for a novice to use it. Then figure out which machine fits your needs. Quilting is a wonderful adventure and an artform accessible to everyone.